In a 2015 Washington Post article, the Journal of the American Medical Association reported that over 60% of adult Americans, or three out of every five, used some form of prescription drug. In the same year, the National Institutes of Health reported that half of all Americans use vitamins, and spend $36.7 billion each year on the supplements. That’s a pile of pills to track. Keeping what you take organized and secure requires a few basic steps. It’s all about communication: Talk with all your physicians and inform each as to what you take and who is prescribing medications. Inform them as to your supplement and OTC drug use, as certain supplements interfere with prescription medications. Even if you are perfectly healthy, see your doctors regularly: Get an annual physical and blood work to check for signs of drug interaction issues or drugs that are no longer working. Keep a list of your medications with you: A card in your wallet is an easy way for emergency medical personnel to know (descriptive medical documentation available in Pillist . Or use a smart phone app, such as Medsafe, a web application in plicate which manages multiple prescriptions and reminds you when it’s time for a dose. Automatic vs. call-in refills: For those who get too busy or forgetful to call for refills, putting medications on auto-fill is an advantage. 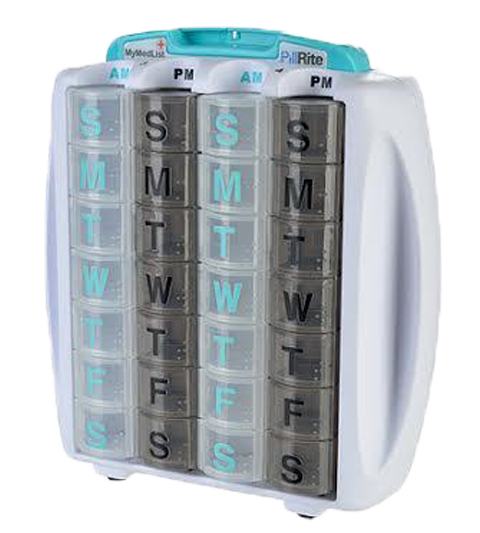 The pharmacy will fill the prescription when it is due, and usually call or email the doctor upon the final refill. Call-in refills keep cost control in the hands of the consumer, and can prevent wasteful refills if a drug type or dosage changes. Mail order pharmacy vs. retail store: Mail order is convenient and can save money, especially for medicines you use regularly. But drug shipments arrive late, get lost, stolen, damaged or wasted when a dosage changes after a shipment arrives. And when you use the retail pharmacy, you communicate with a person who knows you, not an “800” number. Prescription medication theft is a critical issue: whether it is the teenager stealing Grandma’s pills or hospital volunteers and staff siphoning off supplies from their own pharmacy, drug diversion costs insurers over $100 billion annually. Proper prescribing, storage and disposal of medicines plays a major role in lowering both the financial and human cost. 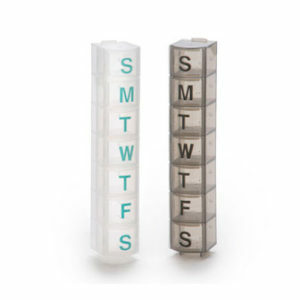 Visit Pillrite’s website for a medicine organization system to store and manage your prescriptions for up to a month. Do you have trouble taking pills? Do you gag or choke when you try to swallow your medication? Whether you are taking one pill or a whole handful, taking them for a limited time or the rest of your life, getting them down can be a challenge. Studies show that among people who have difficulty taking their pills, about one-third end up gagging, choking or vomiting. It may seem like a minor problem, but some of those who are uncomfortable taking their pills skip doses, which can lead to more serious medical problems. If you have to take several pills, take them one at a time. To swallow a pill easily, take it with plenty of liquid. According to a report from the Annals of Family Medicine, many people are successful at swallowing tablets using the pop-bottle method. Take a plastic water or pop bottle filled with water, put the pill on your tongue, close your lips securely around the opening and take a drink, using a sucking motion to swallow a mouthful of water and the pill. Don’t let air get into the bottle. If you just can’t get that pill down, try using soft food, such as a piece of bread. Chew a small piece of bread, but before you swallow, place your pill in the chewed bread in your mouth. Then swallow the bread with the pill inside. Before using this method, check the instructions on your medication to see if you have to take your pill on an empty stomach. If possible, get pills that are coated, as they tend to slide down more easily. Sometimes swallowing a pill just takes practice. Repeated gagging and choking can make you feel anxious about taking your medication, but as you practice and get better at it, you will feel more comfortable and confident. You can practice with candy, starting with very tiny candies, such as sprinkles. A sip of water before swallowing and another after helps the pill, or the candy, go down. When practicing, try different ways of swallowing. Some people prefer to place the pill on the back of the tongue and drink water until the pill goes down, but others use a straw, or tilt their head a little. Keep trying until you find the method that works the best for you. For questions regarding your medication, contact us.